Introduce or reinforce your chores and responsibilities unit and provide additional opportunity for your students to interact about their daily responsibilities at home. The layout is simply organized and helps prompt students to explain who does the chores (or who does not), when and how often. The interactive card consists of seven, bilingual questions and open-ended responses (conjugated present tense) that can be used for paired or group work or to view on a document camera or smartboard as a notetaking activity. Page can also be laminated for durability and used as a flashcard for seatwork practice and review. 7 bilingual questions and open-ended responses formatted for seatwork, the document camera or smartboard (2nd year and above language learner levels, Immersion and Heritage speaker). Extra practice in a simple format. Sometimes you just need a quick activity for those substitute days without the extra preparation time. File it away in your teacher toolkit by topic for when you need a quick change of pace. Chores and Responsibilities Prompt Card can be used to supplement your current curriculum. If you would like additional support materials for your class and giving advice topic unit, please see my other related resources below. Maestra Mapache Creations has coordinated these collections of vocabulary, dialogues, worksheets and images to be your versatile tool for both verbal and written activities. Thank you for visiting my store! ¡Mil gracias! Haz un clic and Follow! Home Topic Simple Question and Response Prompt Card is a stand-alone product and is also available as part of a Spanish 1 activity pack. 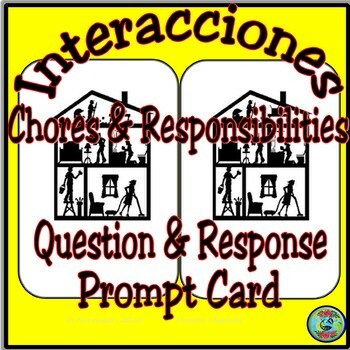 Chores and Responsibilities Question and Answer Prompt Card is a stand-alone product and is also available as part of a Spanish 2 activity pack.